The Glen Urquhart check is something we’ve seen a few times in the James Bond films. 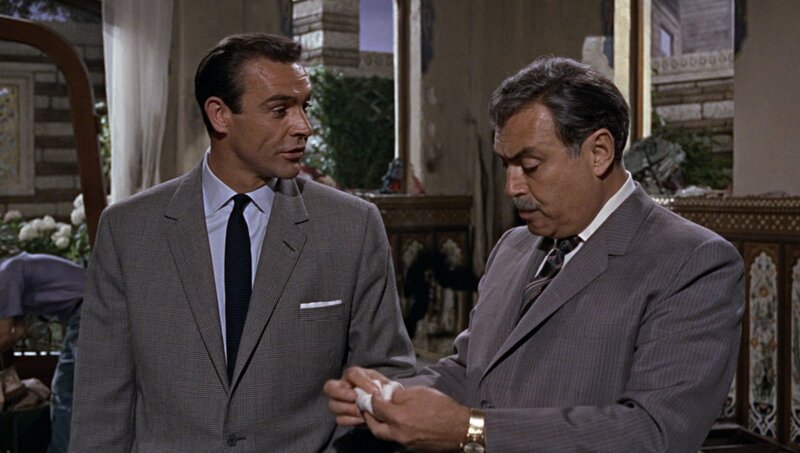 The true Glen Urquhart check is a black and white check in an even twill weave, and the closest example to this is the one Sean Connery wears in his second meeting with Kerim Bay in From Russia With Love. I’ll explain later how it differs from an authentic Glen Urquhart check. George Lazenby wears a variation on the Glen Urquhart check with a little extra white in the pattern and a blue overcheck in On Her Majesty’s Secret Service, Pierce Brosnan wears a coloured variation in GoldenEye, and Daniel Craig wears a darker variation in Skyfall. On four occasions Sean Connery wears finer pattern similar to the Glen Urquhart check, at half the scale and woven in either a plain weave or a hopsack weave. These are for another article. The Glen Urquhart check is sometimes also called Glen Urquhart plaid, glen check or glen plaid. Glen check and glen plaid are good terms to use to describe all variations of the Glen Urquhart check, whether it’s a different colour or a different weave. Often the Glen Urquhart check is incorrectly called the “Prince of Wales” check. The authentic “Prince of Wales” check is actually in red-brown and white with navy separating the different sections of the check. Sometimes “Prince of Wales” is used to describe a glen check with any overcheck, which is like a windowpane over the plaid. Such an example would be George Lazenby’s modified glen plaid suit with a blue overcheck. Pierce Brosnan wears a suit made from a classic Glen Urquhart check with a red overcheck in many episodes of Remington Steele. The Glen Urquhart check is made up of four sections. 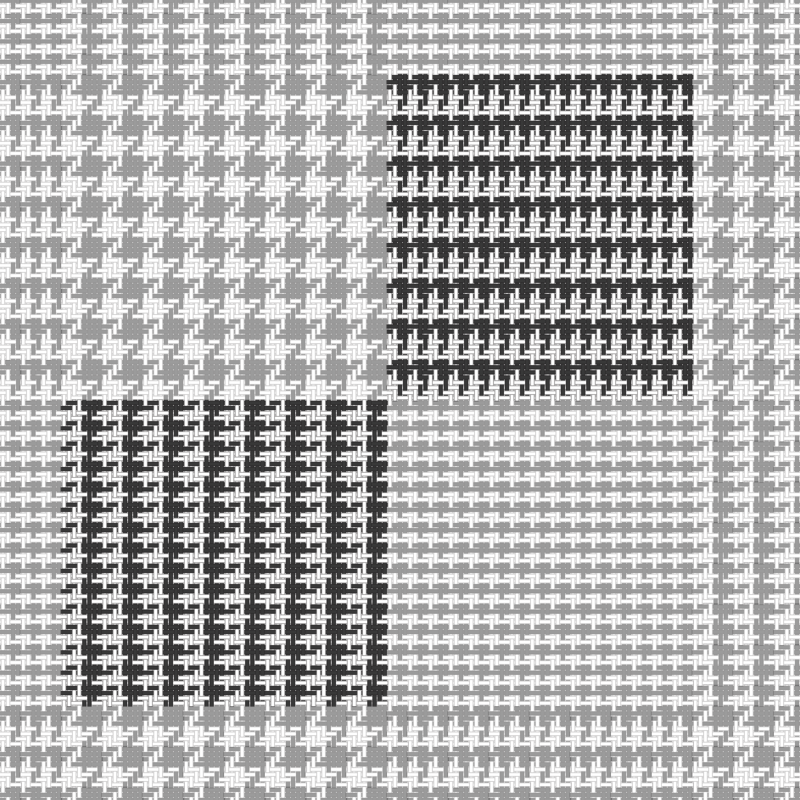 The largest section is a houndstooth check, and it’s made up of alternating four light yarns and four dark yarns in both the warp and the filling (weft). That means in both directions the yarns alternate four and four. 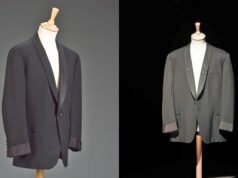 George Lazenby’s glen plaid suit is darker horizontally than it is vertically, meaning whilst there are four light and four dark filling yarns, there are probably five light and three dark warp yarns. The section opposite the houndstooth section of the check is a two and two check, made up of alternating two light yarns and two dark yarns in both the warp and the filling. There is a subtle stripe effect in the two and two pattern, and depending on the layout of the pattern in relation to the twill weave the stripe can be in either direction. In the illustrations here the stripe is crosswise, but in From Russia With Love the stripe is lengthwise. In On Her Majesty’s Secret Service the stripe is crosswise, and tt’s also a more defined stripe because this section of the plaid is not actually a two and two. Whilst there are two light and two dark filling yarns, there are probably three light warp yarns and one dark warp yarn in George Lazenby’s plaid. The other two sections have alternating four light yarns and four dark yarns in one direction with alternating two light yarns and two dark yarns in the other direction. 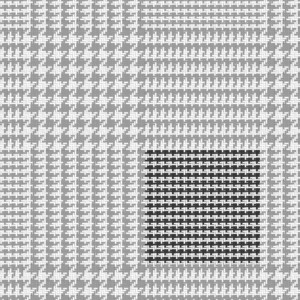 This creates a stripe effect that leads from one houndstooth section to the next. On Sean Connery’s Glen Urquhart check in From Russia with Love, the houndstooth check eases into the striped section with a strip of three dark yarns. 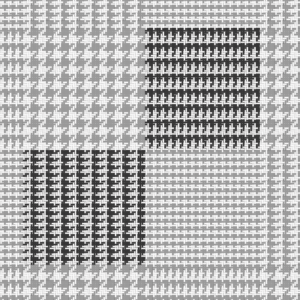 They are bordered with four white yarns on the houndstooth check side and two white yarns on the other, which starts the striped section. This strip of three black yarns means this is actually not a true Glen Urquhart check, but it’s a more symmetrical check and a creative variation. Daniel Craig’s glen plaid suit in Skyfall is actually the closest to an authentic Glen Urquhart check are far as the pattern goes, but being black and grey instead of black and white is where it differs. Matt, seeing as you are far more knowledgeable upon these fabrics than I, does a different name apply to a Glen Plaid overcheck that rust extremely contrary to the norm? 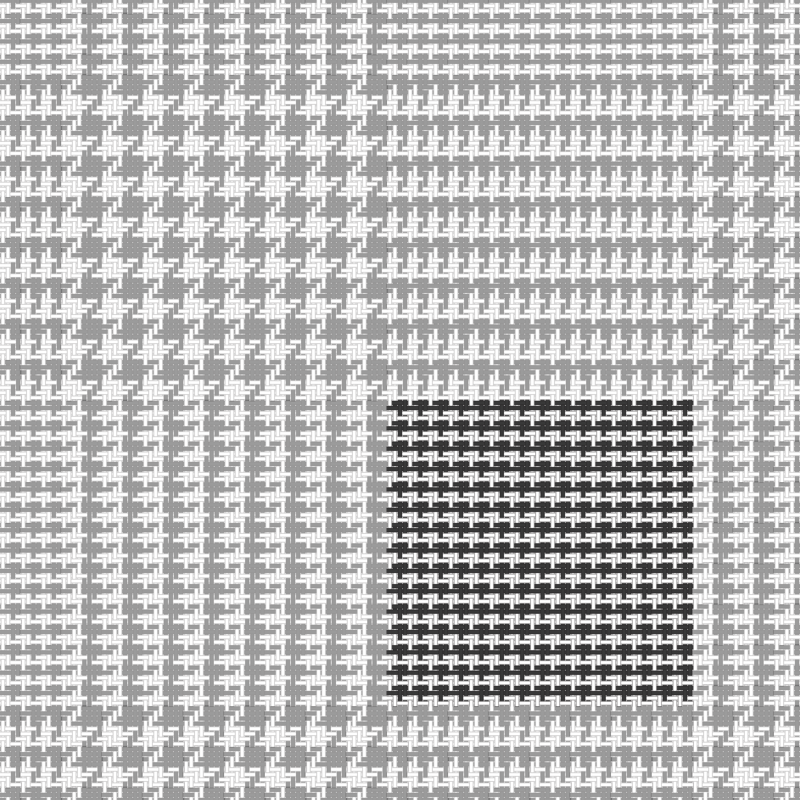 I’d call it a Glen Plaid overcheck for lack of knowing whether to call it anything else, but the pattern is notably smaller than the classic examples, and a bright brown weave frames the houndstooth pattern in addition to the light blue overcheck. All in all, a bit busy and non-traditional, which is why I ask if it would even be considered in the Glen Plaid family. P.S. : The photo hasn’t been reversed, that IS a flapped patch pocket on the right side. There’s no specific name that I know of for a check like that. It’s a very nice check. I haven’t even read the post yet, but I am wearing glen check trousers today. 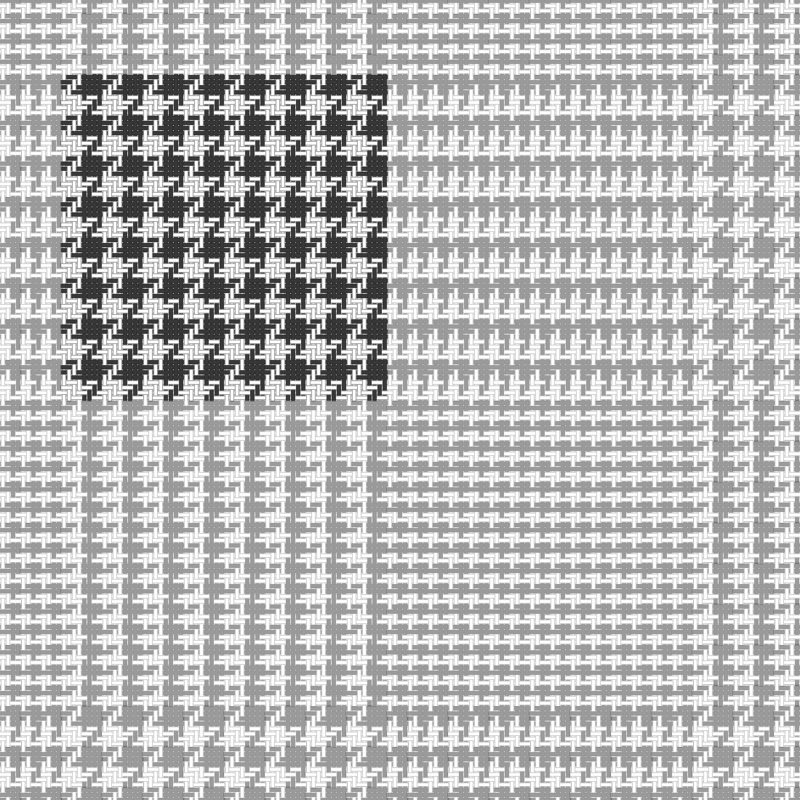 I was staring at the pattern while I was waiting at a red light on the way to work. I was thinking about how that friend of the POW would have come up with the pattern. TSOJM read my mind! Matt. What’s the rules on wearing Glen check pattern of an evening? 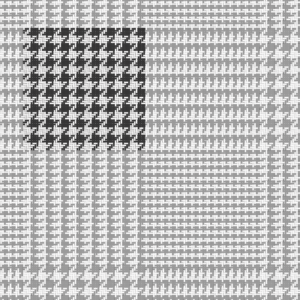 Is it strictly a daytime pattern? It’s definitely more of a daytime suit. Daniel Craig’s darker check could be worn in the evening. Your article shows the complexity of the design. With all those things going-on at once it’s a miracle that it works and has become a classsic. 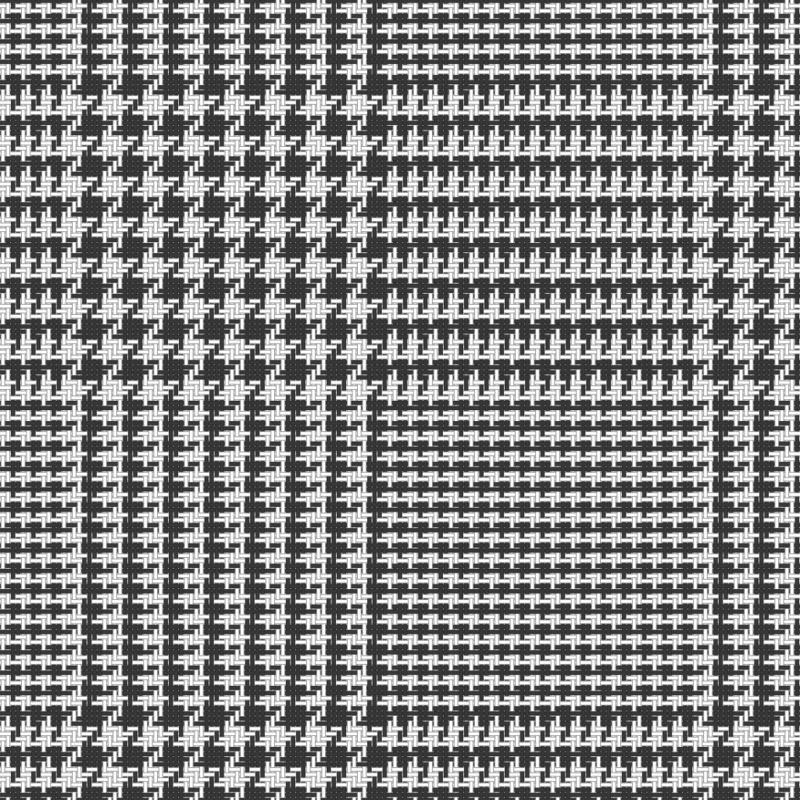 I shall never look at a glen plaid the same way again. Impressively informative post, Matt. I am amazed how much I have learned about these things in the last three years. Keep up the good work. 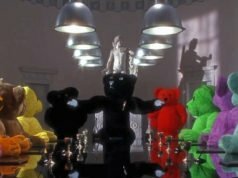 As a Bond fan, I feel I need to point out that this blog has made me reassess the film’s smaller wardrobe details in a way I’d never even thought of before. Usually Bond’s clothes only stood out to me if I thought they were particularly inappropriate or dated (stand up The Pink Tie, The Borrowed Dungarees, The Terrycloth Onesie) rather than the number of vents, the cut of the jacket or even whether or not the suit was single or double breasted. I was more in to absorbing the dialogue, the music, the editing, performances etc. To be given all this new, highly specific information for free, on pretty much a daily basis, is sort of blowing my fanboy mind a little. And I’m very happy about it. For the record, I could never afford a new suit (self employed), I’d probably find something inappropriately dated second hand and even then, when I put jackets on, my arms are highly restricted wearing them and feel – at 5’7″ – that I look like a child dressing up in his Dad’s clothes. But I certainly appreciate the look on others now and find myself thinking “that top button is too high” or “that Windsor knot is too loose” when meeting other people who can get away with wearing them. Hear, hear. It is the same as learning the sartorial equivalent of fine food and wine! I have a light greyish-brown linen/wool blazer . I believe it is a glen check weave, or something similar. I’ve been trying to mix and match it with trousers of different weaves. Matt, what type of trousers do you think would work well with the jacket I described? Thanks for the detailed explanation Matt. Too bad the lovely pattern of Craig’s suit in Skyfall was ruined by the horrible fit. I was waiting for that kind of article for a long time ! Thanks Matt for this very detailed explanation. Any chance that you can post a picture of the original Prince of Wales pattern ? Where can I find the specific “Prince of Wales” glen plaid check you mentioned? It’s hard to find exactly what you mean online. Thanks Matt for such a wonderful and detailed article. I was trying to brush up my knowledge on the Prince of Wales fabric pattern but I came out knowing so much more from this. It would’ve been great to have two pictures comparing the actual PoW vs. the Glen Plaid to make it easier to distinguish between the two. Still, this is a fantastic guide. Keep it up! I wonder why glen check is so rare in even the available swatches of custom taylors; they always have a colorful over-check/windowpane pattern. I would have thought the basic one would have been the most versatile.